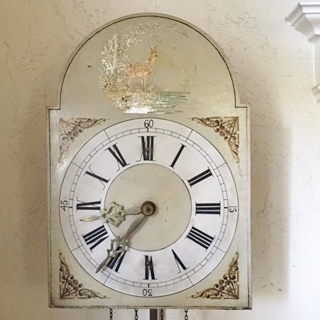 The clock in the photo above hung on the wall in the dining room of my grandparents’ house on Academy Way in Dinuba, California. Each morning Grandpa Willems would lovingly wind it, pulling each of the brass weights up to the top so they could begin their daily descent, the time weights slow and steady, the chime weights with a sudden whir as the clock sounded out the hour. The steady tick of that clock brought life to the silence of the house when I was along with my grandparents. I loved that clock. I thought it was beautiful—the gleam of the brass, the lovely ivory face with its subtle brown forest scene. I longed to own that clock, hang it in my own quiet dining room when I grew up, but I knew that almost surely would not happen. I was just one of a whole passel of grandkids, and I was not the oldest. Even though it was my grandfather who lovingly wound the clock each morning, this was Grandma’s clock, brought over from Russia to North America when her family emigrated in 1903. Grandma was Heinrich and Maria Zimmermann’s oldest daughter, and I figured that when Grandma died the clock would likely go to Grandma’s oldest daughter, stay on the female line of descent, which is indeed what happened. [i] The clock now hangs in the home of my cousin Mary Ann (Davis) Regier, my Aunt Mary’s daughter. It still keeps time. It is still loved and cared for. [i] Mary Ann is the oldest daughter of my aunt, Mary Willems Davis. Aunt Mary was the second oldest of Grandma’s daughters and received the clock when her older sister Helen Willems Thiesen died. Aunt Helen had no children. [ii] Krahn, Cornelius and Ervin Beck. (1989). Clocks. Global Anabaptist Mennonite Encyclopedia Online. Retrieved 10 August 2015, from http://gameo.org/index.php?title=Clocks&oldid=103070.